“ABACA” IS the 31' Sea Pony made by Activa marine and is a true fishing machine with trawler/weekend cruiser capabilities. It is a Magnificent vessel with a great ride, outstanding performance and wonderful accommodations. If you are looking for high quality, speed, great fuel economy and the reliability of a diesel engine, then you must see and drive the Sea Pony. 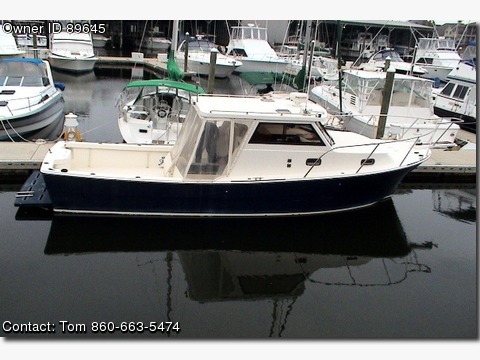 The performance, fit and finish will make you an owner of this new to the market pocket yacht/sportfisherman. The Sea Pony comes with more standard equipment than any other vessel in its class. The Activa/Hi-Star design team improved the speed, performance, handling at dockside, economy, and accommodations which include the comforts of a small yacht to make this vessel able to be used for fishing as well as pleasure. This proven rough-water hull was designed to be a true fishing machine with weekend cruising capabilities. Single 370 hp Yanmar, bow thruster, and an air-conditioned cabin make this a capable performer with the extras you want. Built and designed for the sea of Japan, excellent rough water vessel, loaded with optional features: genset, anchor windlass, massive engine access, 3/4 pilot house, air conditioning, custom flag blue hull sides, solid glass const, bow thruster, low hours. ALL MECHANICALS JUST SERVICED AND MADE READY FOR THE 2007 SEASON TO INCLUDE: generator, ice maker and down rigger. In addition, all fuel filters, water pump impeller, transmission, generator and the 250 hour service was performed on the Yanmar. The mechanical is good to go. THE HULL IS SLEEK AND SHE HAS GREAT LINES FOR THE ROUGH SEAS AS WELL AS MASSIVE DOCK APPEAL. THE OWNER STATES THAT SOMETIME IT IS A NEGATIVE TO TAKE THE YACHT OUT DUE TO PEOPLE STOPPING HIM TO LOOK THE YACHT OVER. A VERY SPECIAL YACHT WITH MASSIVE USES, TRAWL, CRUISE, FISH, FAMILY WEEKENDS, OR THE LOOP!